In this classic article Wight (1960, ‘Why is there no International Theory?’) famously distinguished between ‘domestic’ political theory, whose object was the territorially delimited state, as the theory of ‘good life’ and ‘international’ theory, whose object was the relations between these state with no overarching authority above them, as the theory of ‘mere survival’… More important for our purposes is Wight’s constitution of the domain of international theory by the subtraction of all positive content of ‘good life’, reserved for political theory proper, which leaves ‘international theory’ reduced to a theory of mere survival. International theory is thus from the outset conceived in the privative mode as ‘political theory minus’. This is exactly right. I don’t say that often, so it’s important to do so when appropriate. Now is such a time. I’ve tried to make this point in a different and much more inelegant way by arguing that sovereignty and security are one-and-the-same concept, and the question of the good life, ‘how must one live?’, is answered with one word: securely. But I will restate this formulation of mine, which I have yet to improve on: the logic of inside/outside is made possible by the noetic heterogeneity of the good. Prozorov destroys the intellectual borders and boundaries of IR by giving IR a more important role in the enlightenment of the human race than we usually accord it, or than it usually allows itself. That is no small feat. Read the books. Both of them. I am. Yet there is little insight in this book into how liberalism in the past half century has risked becoming illiberal precisely in response to external threats that, its political theorists insisted, demanded a return to basics. In response to Communism, Isaiah Berlin did not so much defend as deform the liberal tradition, which to that point had focused less on the fight against ideological enemies (except Christianity itself) than on the institutionalization of freedom and equality. Siedentop’s conviction that radical Islam prompts the West to respond with moral clarity about what it represents is the continuation of Berlin’s project: the reinterpretation of liberalism in the face of presumed enemies. Siedentop dallies in the Middle Ages in implausible reaction to anxiety and worry, distorting the history of liberalism and omitting how much further it had to go—still has to go—to take individual freedom and equality seriously. First, I wish to say something about the book in terms of its exegesis of Schmitt. I don’t think Kahn is claiming to be saying anything “new” about Schmitt, either in general or on Political Theology in particular. Since there exist by now hundreds of books and articles on Schmitt and his political theology in German, French, Italian, Spanish (and, since the late 1980s, English), and since Kahn’s thin book lacks even a basic bibliographical treatment of this material and one that does not go beyond secondary literature in English, one would have to assume that this text is not really intended to contribute to the scholarly literature on Schmitt. This is how you review a book. If you have a better example I’d love to read it. I’ve never re-blogged anything in this space, but this post on book annotations and marginalia from the JHI blog is worth it. Especially since John Winthrop’s “Model of Christian Charity” is on my desk, in preparation for class this week! The history of reading has recently witnessed an explosion of interest, doing much to transform and reinvigorate the practice of intellectual history. Although recent histories of reading range across every conceivable genre and period, early modern Europe has played a starring role in the rise of this field of study. This is due above all to the fact that many early modern readers were prodigious annotators. Rousseau ends The Social Contract by saying that he has yet to speak about the state’s foreign relations, international law, rights of war, commerce, and so on. In short, he can write an entire treatise on the ideal sovereign state without addressing these questions. This puts the matter too simply, of course. He does not go so far as Aristotle does, imagining a city with no foreign relations whatsoever – that would be a true Utopia, because it would never exist. But it serves to show the extent to which Rousseau thought the questions that we present-moderns take as primary – security, war, peace, external relations, markets, trade, THE ECONOMY – Rousseau thought to be secondary to the important question of the just and good regime. I resolved to make a very rigid frugality supply my deficiency of fortune, to maintain unimpaired my independency, and to regard every object as contemptible, except the improvement of my talents in literature. I’ve read a lot of Rousseau. Far more than most but also less than those self-identifying as “Rousseau Scholars”. Still, I think I understand him once in a while. Reading his Statement on St Pierre’s Project, that is, Rousseau critique of the idea of Perpetual Peace, I see Rousseau confirms something that I was accused of getting wrong in a public setting. Sour grapes this is not. Rousseau is exasperating and confusing. He means everything he says and refuses to say everything he means. Once in a while I get confirmation from him that I was on the right track, and this just happened once again. (n.b. I say this in full knowledge that he’ll pull the rug out from under me soon enough – but this is the price you pay when studying him). No man can have thought long upon the means of bringing any Government to perfection without realizing a host of difficulties and obstacles which flow less from its inherent nature than from its relations to its neighbours. The result of this is that the care which ought to be given to its internal warfare has to be largely spent upon its outward security; and we are compelled to think more of providing for its defence against others than of making it as good as may be in itself. All I have ever done is try to understand Rousseau’s books as he did. Over the last couple of months I’ve had a couple of reviews published. Both books are excellent. And they are quite related. The first is Nicholas Rengger’s Just War and International Order: The Uncivil Condition in World Politics for the Review of Faith and International Affairs. The second is Robert Howse’s Leo Strauss: Man of Peace for E-International Relations. Both are published with Cambridge University Press. I want to say a couple of things that didn’t make it into the reviews for the sake of space. First, regarding Rengger’s book. It is remarkable the extent to which just war is totally misunderstood, and the reasons causing us to misunderstand it. His point is, essentially that once politics began to question the morality of certain tactics of war, the big question of whether a war was just became displaced by the question of whether our actions were legal. This is a hugely important change because it is no longer easy or clear that we should ask whether or not to allow violence to enter politics but how and in what way politics is violent. This is quite obviously related to the question of security, which only arrives in full bloom once Machiavelli and Hobbes have had their way with the holy books. Violence is permitted too easily. Far too easily. I’m writing this post under the environment of the American Senate releasing the executive summary of its committee report on torture. The questions, “is it worth it?” or “Is it permissible?” miss the moral point. Merely posing them means some kind of moral introspection about the relationship between politics and violence has been lost. This relationship between politics and violence is a running them in Howse’s book. Strauss, it turns out, has a great deal to say about international politics, state violence, international law, and so on. Howse covers an incredible range of material, in Strauss’s written work and in his newly available lecture transcripts. One point which I left out of the review is that using the transcripts is not as difficult as at first seems, despite their quasi-private character. This procedure is perfectly legitimate, as Strauss used it himself. In his introductory essay to Mendelssohn’s The Morning Hours and the Friends of Lessing, Strauss uses the private correspondence between Jacobi and Mendehlssohn to clear up ambiguities in the public record regarding Lessing’s “Spinozism,” that is, whether he was an atheist. Certainly if private correspondence is suitable for that weighty subject, the less private character of classroom conversations can be used for insights regarding questions of everyday political relevance. The one thing I loved about Howse’s book is how it puts to rest any doubt that Strauss resembles the caricature usually represented in popular media. The polemical case against this has already been made by a handful of others in the aftermath of America’s invasion of Iraq, but now we have a philosophical case against this nonsense. Any writers who continue extolling that simplistic tripe demonstrate the shortcomings of their reading habits. To wit, this bizarre review by Richard Wolin in the Chronicle of Higher Education. We leave this review learning more about Richard Wolin than either Leo Strauss or Rob Howse’s book. Though Wolin has faced criticism recently about his reviews. Two reviews well worth reading are from Steven Smith and Benjamin Wurgaft. Video of a dialogue on the book held at Penn State with commentary from Anne Norton is available here. I explore and defend the claim that the physi­ cal body plays a pivotal but unacknowledged role in ideas about the human in the fifth and early fourth centuries, as well as in the formation of a new kind of ethical subjectivity centered on practices of caring for the self. I explain the strength of its influence in terms of its dual identity. On the one hand, the phys­ical body is a model of intelligibility: although its workings are hidden, a physi­cian trained in the medical tekhnē, “science” or “art,” may reconstruct them through reasoning. Doing so allows him both to intervene in disease and to manage health. On the other hand, that body is an untrustworthy and unfamil­ iar thing: it is prone to disorder, largely estranged from consciousness, and ani­ mated not by intentions but by impersonal, asocial powers. Its very strangeness, I argue, encourages ancient thinkers to take an increasing interest in the psukhē as the locus of the person. As with all PUP book, the intro is freely available. Scroll down to pages 24-5 and you’ll see some thoughts on the role that the body plays in Thucydides’ account of the politics of the plague and presentation of the Funeral Oration of Pericles. Biopolitics in Ancient Greece is worth attention, hence the project on “Periclean Biopolitics” that I’ve been saying is “the next project” for a couple of years now. Anyways, based on the introduction, Holmes looks to have written a very interesting and important book. A study concentrating on the shared word “spirit” would be very interesting. 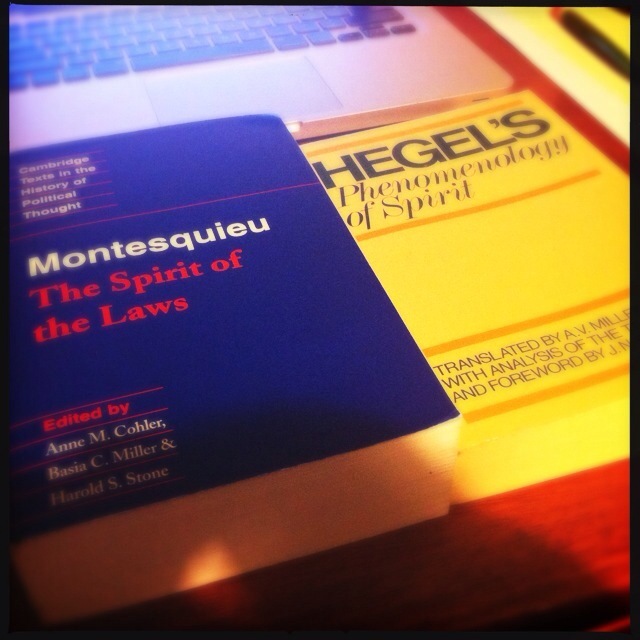 Though I’ve already counted Hegel in a list on “Mind”!